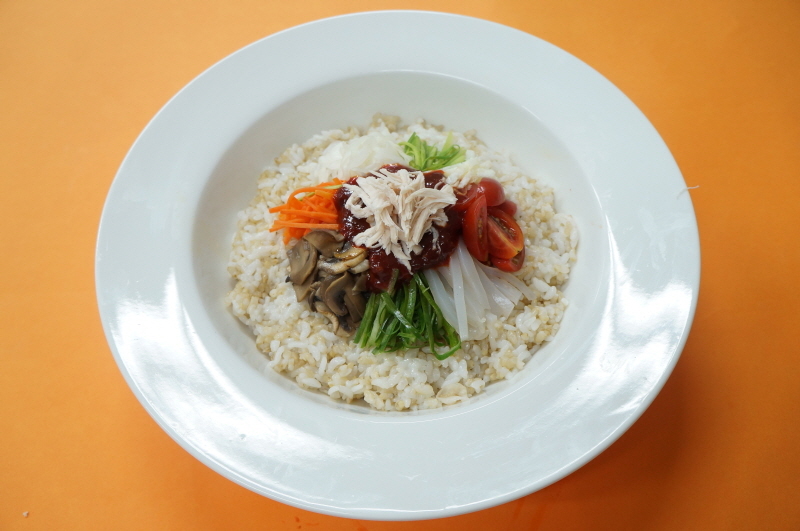 Specialized Bibimbap Anti-obesity | 언어권별 조리메뉴얼 | [new]비빔밥세계화사업단 홈페이지에 오신것을 환영합니다. 01. Use 8:2 ratio of brown rice to white rice and cleanly wash them. Soak in water for about 30 minutes, and then cook until rice is well cooked. 02. Cut cucumbers and zucchinis into pieces 4 cm long, slice the pieces at 0.3 cm thickness by rotating, and then thinly slice them. 03. Cut cabbage and carrots into pieces 4 cm long and julienne the pieces. 04. Cut mushrooms sideways into pieces 0.3 cm thick. 05. Add cooking oil to a heated frying pan, and fry cucumbers, zucchinis, cabbages, carrots, and mushrooms separately for 30 seconds over high heat. 06. Cut konjac into pieces 4 cm long, julienne the pieces, and parboil in boiling salt water for about a minute. 07. Cook tomatoes in boiling water and then slightly fry them in olive oil. 09. Soak chicken breast in the marinade for about 30 minutes to remove unpleasant odor, cook in boiling water, and then tear along the texture into smaller pieces. 10. Grind kiwi using a blender and mix the ingredients to make the fruity pepper paste. 11. Place prepared ingredients over and around the rice and add the fruity pepper paste.